One Less Nemesis Blog: Sale on our One Less Bully Shirt! Sale on our One Less Bully Shirt! 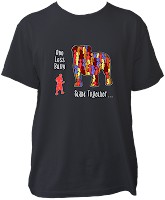 We're having a sale on our One Less Bully Stand Together shirt. It's only $15 (regularly $24.99) through 3/25/11 whiles supplies last. We feel like this is such a great and important message. The more people stand together against bullying behaviors, the less power those bullies have. Take away their power and the hurt they cause! One Less Bully - Stand Together! Don't forget to "Like" us on Facebook and follow us on Twitter!